Pontificia Javeriana University, Bogota Colombia, 1990-1996 M.D. Born in Colombia, Dr. Mendoza practices general and cosmetic dermatology. 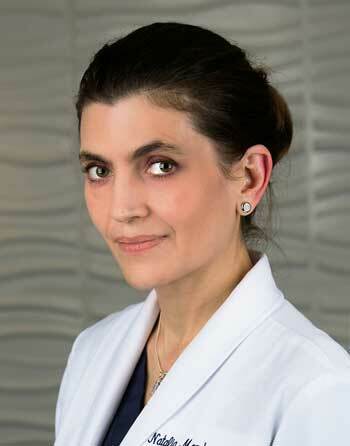 In addition to her dermatology education and training, she also has a wealth of experience conducting clinical research, which she obtained as a dermatology fellow at one of the leading practices in that area. This experience has also enabled Dr. Mendoza to have her manuscripts and articles published in dozens of medical textbooks, journals, and other publications. Additionally, Dr. Mendoza is bilingual, speaking English and Spanish fluently. She resides in Williamsburg with her husband and young daughter. "Dr. Mendoza is a very caring and thorough doctor. She is outstanding and I appreciate being able to see such a compassionate doctor who sincerely tries to help. Thanks!" "I would recommend Dr. Mendoza in a heart beat." "Dr. Mendoza is friendly, efficient, and answers all my questions. I am glad that she is my dermatologist." "There were so many things that made my appointment exceed my expectations. The receptionist was polite, courteous and most welcoming. The medical assistant was friendly and treated me respectfully as she entered my information. My exam with Dr. Mendoza was so thorough that I felt it was the best head to toe exam in the last 10 years. The clinical technician who obtained the specimens was so kind and gentle. I'm thankful for the service that was provided to me and for me." "This was my first visit and I was very very happy with Dr Natalia Mendoza. She was pleasant and very knowledgeable and not only addressed the original issue I came in for but she asked if I had any other issues and addressed all of those, too. I was so impressed with her that I have recommended her to family and friends."